Shopify has gained worldwide popularity as a decent eCommerce software, which comes with lots of niche-related features and tools. The service makes it possible to effectively launch and manage all kinds of web stores, ranging from small and medium shops and up to amazing hypermarkets with thousands of products in stock. Shopify’s functionality is far above the average and this is exactly what allows achieving decent result. The service offers multiple web design tools, responsive eCommerce templates, marketing and promotion features and well as advanced integration options. It’s hard to call Shopify an easy platform for inexperienced users. If you are using the system for the first time, you’ll need to get used to it and to master the entire spectrum of its options. This is where some of the best Shopify eCommerce samples with come in handy. Whether you’re choosing an eCommerce site builder for your future shop or have been thinking about redesigning your current site, feel free to browse our fresh collection of most successful Shopify stores that should give you ample design inspiration for your project! Mamaandlittle.com is a web store of original on-trend teething jewelry. The website is owned and run by Arleene and Hyrum Taylor – a family couple, who have a little son and know exactly how important, safe and quality this accessory is. The online store provides a rich custom made and individually-designed teething necklaces and other related accessories, which come in a variety of styles, designs, shapes, color palettes and features. The store is logically-structured and intuitive in navigation. The Shop Category comes with the pop up menu, providing access to product subcategories like Necklaces, Bracelets, Pacifier Clips, Teethers, Apparel and Gift Cards. As you hover over each product, you see its price, customer satisfaction rating and stock availability. When you proceed exploring it, you will see several original photos of each product and its detailed characteristics. Customer reviews are also available here. There is a blog connected to the web store, in which Arleene shares her maternity experience. This adds a website better appeal and informational value. If you have got used to taking your smartphone along wherever you go, you’ll be excited to visit Phoneloops.com. This is a web store that offers modern, safe and convenient phone loops that are designed in Quebec and hand-crafted in Canada. These accessories help prevent unexpected phone drops and damages, ensuring a secure, convenient and relaxed grip. The first thing that catches the attention when visiting a web store is its trendy look, interactive product images and customer reviews all available at the homepage. There is also a YouTube video providing product overview here. When browsing the store, you will get access to the major product categories, namely Strap, Leash and Customized. 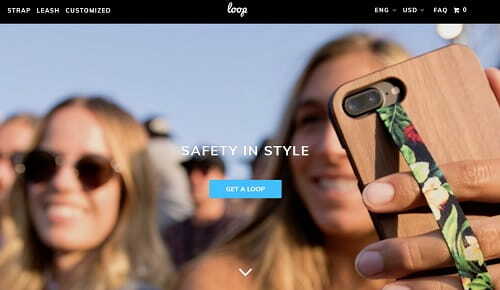 This is where you will be able to choose and add to cart a phone loop of any color, style, pattern and design. Detailed product descriptions are available here as well along with multiple videos showing the benefits of using the loops. The web store is available in two languages (English and French). Currency choice as well as FAQs are also provided here for better shopping convenience. This is a decent sample of a Shopify web store! 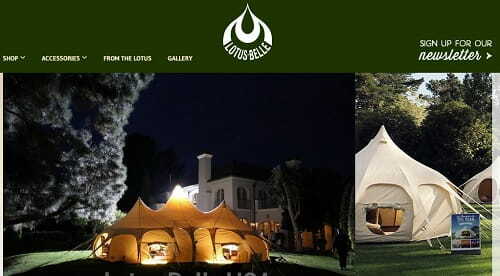 Lotus Belle Tents is the LA-based shop offering unique and custom designed tents to fit different requirements, events and personal preferences of customers. The online version of the store is available at Lotusbelle.com – the web store, which was founded by Harriet Seddon (who is also the author of the tent models). From the very first sight, you pay attention to a large photo slider available at the home page, which offers the images of tents in the most unusual places. They look really stylish and attractive, which cannot but urges the desire to keep browsing the product list. To do that, feel free to select the required menu section or look through the products available directly on the homepage. The website menu itself encompasses the Shop Category with popup subcategories, Accessories Category, From the Lotus and Gallery. The search filter option, customer reviews and newsletter sign up option contribute to the convenient, simple and effective shopping experience. 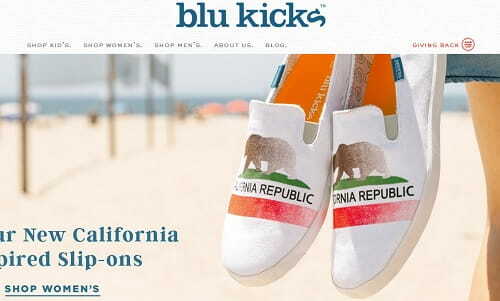 Blukicks.com is a web store, which offers a broad selection of nature-inspired shoes for kids and adults. The business is run by the mother and son, who state their major mission in the About Us section. One of the most unusual things about the online store and the business in general is that 1% of each product cost is donated to the organizations involved into environmental protection. The web store itself looks neat, simple yet informative. All the must-have elements are included here, whilte the product catalogue is logically-structured and offers easy access to all the items offered for sale. The menu offers the drop down sections, which grant access to product categories. Whatever product you will shop for, it will come with detailed specifications, sizes chart, stock availability info, photos and cost. A Blog, a Newsletter and a Press sections make it possible to find out the news and updates of the store, keeping customers aware of the information they need. 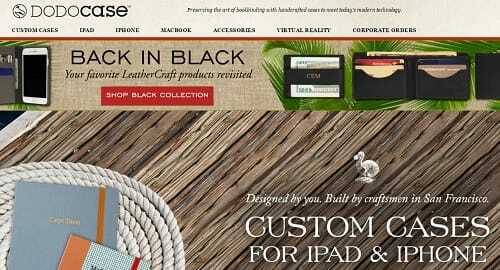 The web store creates positive impression from the very first sight, being a decent sample of Shopify-based projects. Mindjournals.com offers exceptional experience for each and every guy, who needs support and is willing to become more confident and self-assured. 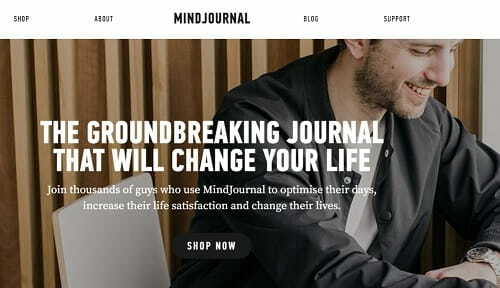 The website focuses on selling the only product – Mind Journal, which offers the required tools and means of making long-term plans and life changes. The online store provides explicit information about the Mind Journal, its sections and implications. There are also customer reviews, each of which is verified to provide maximum trustworthiness. The Blog Page, which is connected to the website, includes informative articles on the art of journaling for men. This should help guys feel confident when using the product, getting maximum pleasure and satisfaction from the process. This is a quite extraordinary sample of a Shopify-based web store with only one item offered for sale! 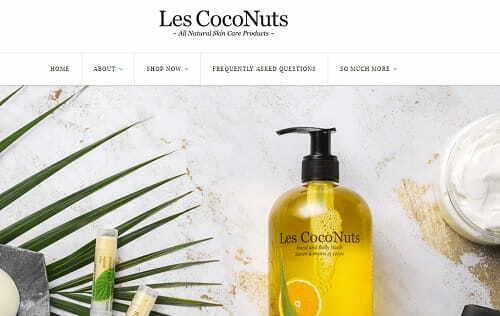 Lescoconuts.ca is a worthy example of a large online store launched with Shopify. The major website focus is centered around high quality organic skincare products that are also 100% natural. The structure of the web store is thoroughly thought-over, with all the products being on their places. Customers may browse through different products categories, all of which come with drop-down menus for more detailed division. Each product is intentionally referred to a certain category and comes with explicit descriptions, alluring photos, ingredients it consists of, price and major shopping options. What’s more, there is an opportunity to email the customer support team, if you have any questions regarding a certain product. That’s very time-saving and convenient. FAQ section, support of two languages (English and French), search filter option and a category enlisting recent updates, discounts and special offers enhance the web store functionality. The website features simple, neat and pleasant design, light colour palette to create comfortable and engaging feeling for each and every user. Ilovebiko.com is one of the oldest online stores built with Shopify. Launched in 2004, this site extends what a Toronto designer Corrine Anestopoulos was doing in her spare time. She began as a hobbyist, creating jewelry that she thought was ‘cool and edgy and not so girly’. Later she realised there was a hole in the market for high quality handmade jewelry and decided to grow her hobby into a full-time business. The first screen of the website shows us impressive high-quality photos in the slider and the newest products. The second slider, at the bottom, is an Instagram feed – catch a glimpse of what inspires Corrine and what goes on behind the scenes. You never get a second chance to make a first impression – that is why you should pay attention to what you have on your website’s homepage. 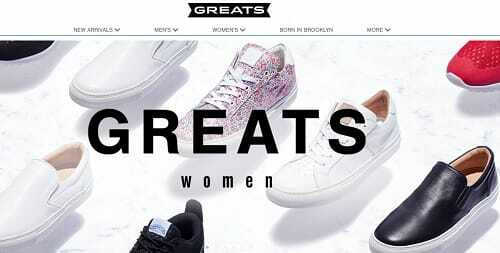 For any site, the homepage is its virtual front door, and we think that Greats.com did a great job designing that door: white backgrounds, lots of whitespace, slider and simple navigation make the site easy to browse and buy from. Perhaps the most outstanding design decision of this website is the top menu where you can choose footwear you need by their silhouettes. You can also see short embedded video interview with Greats owner on the Born in Brooklyn page – another rare thing on websites of such kind. 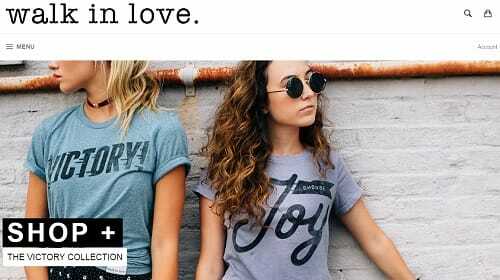 Beardbrand.com gives shoppers a beautiful full-screen experience. The site does exactly what it aims to do – make viewers want to grow their beards out! All accessories you need to make your beard perfect concentrated in two menu categories – Products and Collections. The company started with only three products and have grown their inventory from there. The full collection is featured in a simple grid, while each product opens up in an individual full-screen photo with a detailed description, customer reviews and product questions. The good thing is an easy access to the live chat, in case you want to have your beard accessories ordered right now and not a second later. 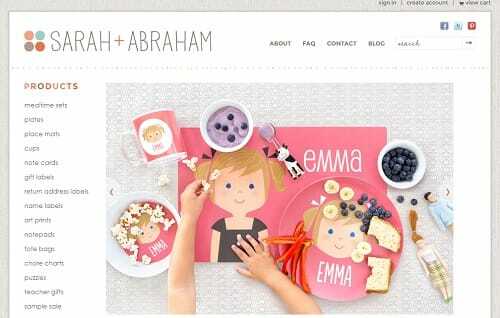 The Sarahandabraham.com website was born in 2007 in Illinois. It all started as a simple Etsy shop with only nursery art prints. Nowadays, they have a great variety of personalized paper products, unique gift items, customizable set of plates and much more. The website looks really interesting, it’s almost like it was created by a child (or at least some ideas were). Everything seems to be in its place: all product categories are on the left side and the menu buttons at the top. The color scheme is not distracting. When making your order for a customized item, you can choose from a number of different options, so that the kid picture will resemble your child as much a possible! Dodocase.com is an online shop where you can purchase lots of craft stuff that is quite popular these days. Their top priority are cases and accessories for iDevices – iPads, iPhones, iMac, as well as other staff like wallets and keyrings. If your business is all about selling handcrafted accessories, you will definitely need an interesting design and that’s what Dodocase puts an emphasis on. In a nutshell,, it has a sleek design which looks good, but, unfortunately, this can be said only about their home page. Pages with products are less exciting, but perhaps this was done on purpose to make visitors focus on the items. Speaking about the visuals, there are no full-screen images, which is very odd. While exploring the website, you can say that everything is ok, but still there’s a feeling that something is missing. Erin & Tom are the Brooklyn artists who created Fiercelycurious.com. 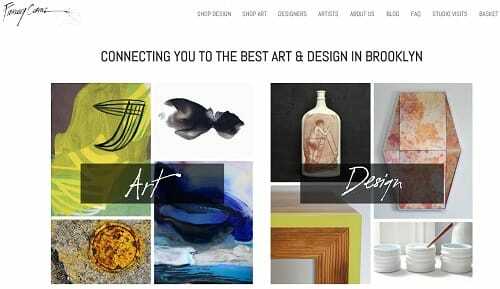 It’s a curated collective of over 20 Brooklyn-based artists hand-picked by Erin & Tom. They showcase their work online, at pop-up shows and through private studio visits. Basically, their website is a mix of an art-gallery and an online store with designer-made items. You can view images in full and it’s good that they have a slider option on board. More often than not, creative professionals come up with astonishing ideas in terms of designs for their websites, but fail to think through the functional side.I Fiercely Curious is not an exception. Their menu could be more structured and user-friendly, while the shopping cart could let you continue to explore the items, instead of pushing you into buying something immediately after you press the add button. 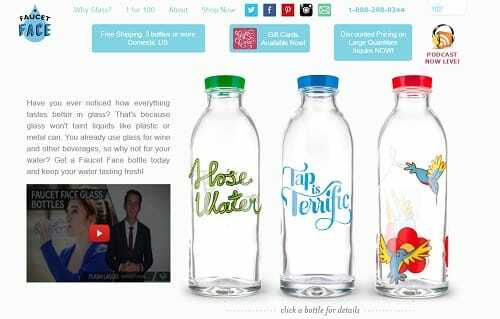 Faucetface.com is a website about the idea that tap water is in no way inferior to the bottled.. How do they prove it? They produce glass bottles and provide BioSand filters for poor families in India. It’s something we could all admire and take for a model. To tell the truth, it took me a while to realize, what they are actually doing because of the overwhelming information. Yes, founders of the website have used the the website builder’s tools to their full potential, but the whole thing looks raw. Although the white-and-blue color scheme is visually pleasing, the interface is cluttered and you don’t know where to start and what to use first. Nice idea but the realization is far from perfect. First impression is the first thing that counts when it comes to online shops. Shopwalkinlove.com knows how to drive the attention of customers. The online shop was launched in 2005 and is dedicated to selling well-designed, high quality t-shirts with a positive and inspiring message. The only look at the website is enough to get the idea of what they are offering. There is no need to waste time and effort exploring the sections in order to find the required item – the most popular products are presented both at the home page and in the main pop-up menu found at the side bar. Just scroll down and make your choice! Premierestateswine.co.uk is a nice sample of an online store that offers different types of exclusive wines for sale. The only look at the website is enough to understand what exactly customers may find there. There is no need to browse through the site looking for the sort of wine you need for your special occasion. The top sellers are provided at the home page and come with detailed descriptions. The catalogue of products is conveniently subdivided into several sections based on the sorts of wines available at the shop. The pop up Review and Live Online Help windows contribute to the informational value of the site, making it user-friendly. Swagpaper.com offers a rich collection of removable “peel and stick” wallpapers that can be used in any interiors. The website provides the feeling of immersion into the world of wallpaper ornaments that are shown to advantage against the white background. The design of the site is a bit simple, but this simplicity makes an accent on the products the company offers for sale. The main menu enlists the most useful categories that are within reach of users. Availability of the Blog section, integrated shop, installation guide, FAQs and contact info contributes to the ease of search and makes navigation simple and understandable. A nice choice for successful shopping! Once again it’s clear that you can create a website of your dream with a website builder. But it’s essential to have a have a clear vision of the end result. There are lots of modules you can use, from the Callback option to the Slider feature. With Shopify, you can create a successful online store with interesting solution and unique design. It’s not that hard to create an engaging and popular website, even with a standard set of modules, you even don’t need to be a techie, but it’s vital to put a lot of thought in it and commit to continuous development.